The parable in the New Testament concerning Jesus and his encounter with the fig tree just before overturning the money changers tables in the temple has always been a source of contention for many people; Christian and Jewish alike. This was the first time I ever heard of the book of Romans, which to my mind is the key to the larger meaning of the New Testament. 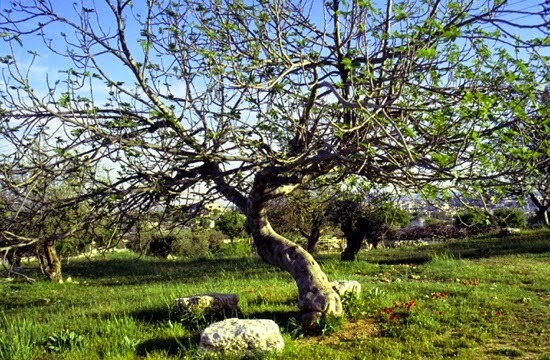 It explains; in the form of an olive tree; the relationship between the Jewish faith and the Christians. This past weekend I was reading the Religious Viewpoints column in the newspaper. I find it to be informative; and sometimes infuriating; but I enjoy reading it as both an intellectual exercise and also due to the possibility of learning something new. In this case I was pleasingly surprised to see that some of my suppositions concerning the larger meaning of the New Testament were possibly shared by another person; and a Reverend to boot! The incident with the fig tree troubles many people when they first encounter it. Stripped of context, it can make Jesus seem petty and impulsive. But Jesus wasn't just being an unreasonable jerk to a plant. Instead, he was making a point. The Israelites believed that they had a special relationship with God. And in the Hebrew Bible, this idea was commonly presented through agricultural metaphors: God was a farmer, and Israel was his much-beloved plant that he tended. Sometimes Israel was described as a grapevine, sometimes as a fig tree (Hosea 9:10). Well, like any farmer, farmer-God hoped that the fig tree that was Israel would produce good fruit, things like justice and faithfulness. But time and again, the prophets warned their countrymen that Israel wasn't being particularly fruitful in the virtues that God expected of them. And Jesus took up this motif of prophetic warnings in his own ministry. So, in the Gospel of Mark, we're given a little sandwich of stories in Chapter 11. Jesus approaches the fig tree, sees that it has produced no fruit, and curses it. Then, right after that, he marches into the temple and condemns the rank commercialism he finds there. Again, Jesus finds no fruit, this time on the metaphorical fig tree that was Israel. With that done, Jesus and his entourage leave the temple and Peter notices that the literal fig tree has withered, just as Jesus said. The moral of the stories is that Israel needed to finally shape up, that continued fruitlessness would not be tolerated much longer. Tragically, Israel didn't heed this warning, and terrible consequences followed. The temple was destroyed. The nation was scattered. The figurative fig tree withered. Now it's on us. We're called to produce the "fruits of the Spirit," things like love, goodness and self-control. Will we now heed God's call? Or will we be just another bunch of fig trees that refuse to produce fruit? This message is for Pastor Eugene Curry. I just finished reading your wonderful viewpoint in "Voices of Faith" in the Charlotte Observer. I couldn't help but to try and find you to say thanks. I am Jewish. My father was Catholic and my Mom was Jewish. I chose the Jewish faith as an adult. I read the New Testament while in my early 20's. My favorite portion was Romans. I especially enjoyed Romans 11; and the part about the Olive tree. Once again; a tree; just as in the parable referenced in your column. In this section of Romans the Christians are warned about becoming too haughty over the original branches of the tree (Hebrew) being broken off- it says that if the original branches can be lopped off by God then what of the newer Christian branches if they displease him. Reading your interpretation of the parable of the fig tree and Jesus brought Romans 11 to my mind in an instant! How wonderful that you can see the imperfection in us all- and that we do fall short- and so must try even harder to avoid being fruitless. Your column was a breath of fresh air to someone like me who has a hard time with "organized" religion. May you continue to do your work in Peace.